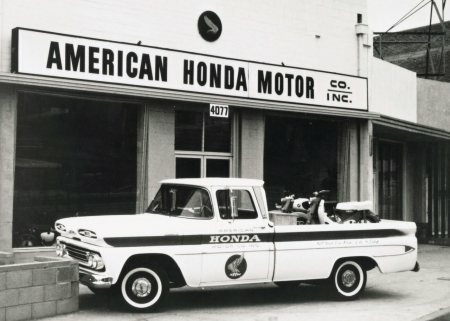 Honda marked its first 50 years in America this week, commemorating the establishment of American Honda Motor Co., Inc., in a small Los Angeles storefront on June 11, 1959. Honda associates observed the occasion with a brief ceremony at the company’s U.S. headquarters in California. Honda operates 10 U.S. manufacturing plants with two new plants under construction, along with 14 R&D facilities and more than 12 regional sales, parts and service, and finance offices around the country. The company’s network of U.S. parts suppliers comprises 545 companies in 34 states with annual purchases exceeding $17.5 billion in 2008. American Honda was the first overseas subsidiary of Honda Motor Co., Ltd., established eleven years after HMC’s inception as a small motorcycle manufacturer in Japan. Honda entered the U.S. market in 1959 with the step-through Honda 50 motorcycle and helped spur the dramatic growth of the U.S. motorcycle market, as it became the best-selling brand in America. 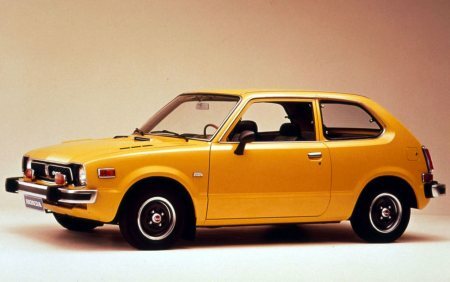 The introduction of the fuel-efficient Civic in 1973 paved the way for Honda’s entry into the U.S. auto industry. As America faced the first oil crisis in 1973 and then the U.S. Clean Air Act tightened air emissions standards in 1975, Civic became both the first automobile to meet the Clean Air Act without the need for a catalytic converter and was ranked number one on the U.S. Environmental Protection Agency’s first list of America’s most fuel efficient cars in 1977. Honda established research and development operations in America in 1975, and U.S. manufacturing in 1979, starting with production of motorcycles in Marysville, Ohio. Honda became the first Japanese automaker to build cars in America with the start of Accord production at the Marysville Auto Plant in November 1982. In May 2009, Honda reached the 15 million unit milestone in U.S. automobile production. In 1986, the company expanded into the luxury automobile market with the creation of the Acura brand, the first luxury nameplate from a Japanese automaker. In the 1990s, Honda introduced the U.S. automobile industry’s first low-emissions vehicles, meeting challenging new emissions requirements in California while also enhancing fuel efficiency. In 1999, Honda introduced America’s first mass production hybrid vehicle, the Insight, followed in 2002 by the Honda FCX, the first fuel cell vehicle certified by the U.S. government for daily use and the first to be placed in the hands of an individual consumer. In 2008, the company began leasing its next-generation FCX Clarity fuel cell sedan, the industry’s most advanced zero-emissions vehicle. In March 2009 Honda introduced the 2010 Honda Insight, America’s most affordable hybrid, with plans to launch another all-new hybrid within the next several years based on the company’s sporty CR-Z hybrid concept vehicle. Honda is now committing resources to advancing Honda’s environmental sustainability with its upcoming cars.